Are you sick and tired of skiing and ice skating? 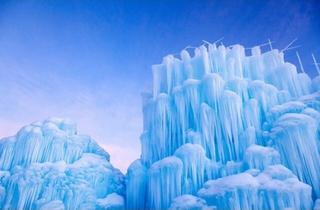 Why not take a trip to see one of America's mind-bendingly amazing ice castles. It's like a walking through a frosty landscape dreamt up by Richard Serra but built by nature. Tickets are now available! Ice Castle founder Brent Christensen built his first ice castle simply because he's an awesome dad. After moving from California to Utah, he tried to get his kids into winter by building an ice-skating rink in the backyard, complete with a slide, a castle turret, and a cave big enough to walk through. It was such a hit he decided to build a whole complex and invite the public to visit. The idea took off and now Brent's ice castle empire that has outposts in Colorado, Utah, and New Hampshire. Each caste starts off as a few icicles that get sprayed with water several times a day and grow into a castle-shaped maze. Each castle continues to grow throughout the winter with an estimated 5,000 new icicles forming each day. The millions of pounds of ice open up into caverns and form towers as high as 60 feet. They're also absolutely gorgeous.